John was a printer in the 1920 and 1930 censuses; a minister in the 1910 Census. [S182] Social Security Death Index (on-line), Ancestry.com, SSDI, Ancestry.com, SSAN 397-10-1675. Marilyn LaPlante lists sons Bramwell and Horace B. It appears that there may be just one son: Horace Bramwell Holcombe. Henry and Mary J. were enumerated in the 1850 Boone Co., IA, federal census. He was 20, a farmer, born in IN, she was 17, born in OH. They were living next door to her parents. Henry and Mary were enumerated in the 1856 Pleasant, Boone Co., IA, state census. He was 27, she was 28. Children in the household were Sara 6, Benjamin 4, and Levi 2. Henry and Mary were enumerated in the 1870 Worth, Boone Co., IA, federal census. He was a farmer, age 40, she was 36. Children in the household were Benjamin 18, Levi 16, Louisana 13, Mary W. 10, James H. 8, John 5, Sophronia 4, and Elizabeth 4 months. Henry W. and Jane S. "Halcomb" were agan enumerated in Worth in the 1880 federal census. He was a farmer age 50, she was 27. Children in the household were James H. 18, John R. 16, Sophronia 14, Elizabeth 10, Darius 9, and Horace B. 5. Also enumerated were Jane's 5 children from her previous marriage. 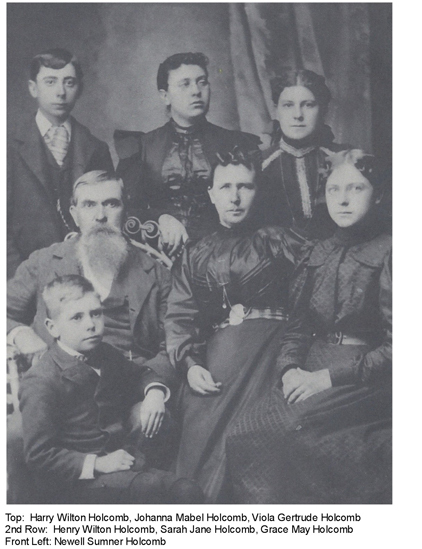 Henry W. and Sarah J. were enumerated in the 1900 Des Moines, Boone Co., IA, federal census. He was a hotel keeper, age 70, she was 47. She had born 11 children, 10 of whom were still living. Children in the household were Joanna M. 19, Gertrude 17, Harry W. 16, Grace M. 14., and Newell 10. Levi Hull married Sarah Wright. Sarah Wright married Levi Hull. Horace B. and Leona were enumerated in the 1920 Harrison, Ward Co., ND, federal census (ED 216, page 3A). He was a mailman age 44, she was 46. 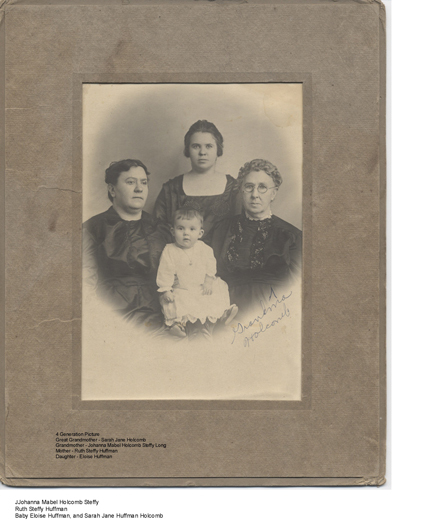 Children in the household were Gladys, Claude, Leslie, Eldred and Evelyn (twins? ), and Howard K.
Horace and Leona were enumerated in the 1930 Minot, Ward Co., ND, federal census (ED 49, page 2B). He was a mailman age 55, she was 56. Children in the household were Evelyn 23, and Kenneth 17. Levi and Victoria were enumerated in the 1880 Jackson, Sumner Co., KS, federal census. He was a railroad laborer age 27, she was 22. The only child in the household was Ethlym 2. James H. and Alice L. were enumerated in the 1920 Lemoore, Kings Co., CA, federal census (ED 247, page 6A). He was 58, she was 57. The only child in the household was James Jr. 18. James H. and Alice were enumerated in the 1930 Lemoore, Kings Co., CA, federal census (ED8, page 5B). He was a farmer 68, she was 67. The only other member of the household was brother-iin-law Harry(?) M. Reed 68. 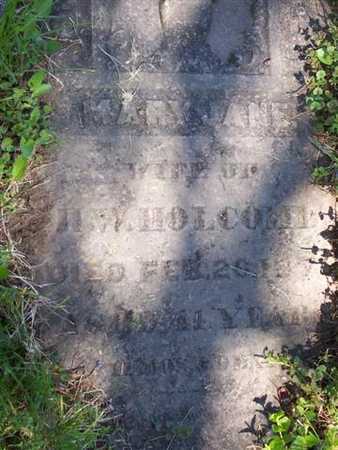 There is a John R. Holcomb enumerated in the 1930 Eschbach, Yakima Co., WA federal census age 66. The wife listed is Lillie M. age 57 (19 at first marriage) There is a daughter Louise M.(?) age 15 as the only child listed. Anthony and Elizabeth were enumerated in the 1920 Minot, Ward Co., ND, federal census (ED 231, page 7A). He was a bank president, age 60; she was 49. Children in the household were Eva M. 20, Clarence 18, and Ruth 14. Darius and Letha were enumerated in the 1920 Minot, Ward Co., ND, federal census (ED 231, page 20A). He was a teamster 47, she was 36. Children in the household were Hazel 19, a son 17 and a son 16, Edna 9, Donald 7, and Doris under 2.